CROCKETT – There was an electricity in the air on Friday morning, Sept. 14. For the first time in 55 years, the Crockett Bulldogs and the Grapeland Sandies were set to square-off on the gridiron. To say there was a little smack talking in the weeks and days leading up to the game would be the understatement of the season. The Bulldogs came into the game with a record of 1-1, having lost to Buffalo, 28-33, but having defeated Garrison by a score of 34-20. The Sandies, meanwhile, had a record of 2-0, with wins over Milano (27-0) and Cayuga (28-8). Something had to give in this Houston County match-up. 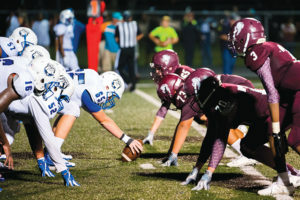 In the end however, it came down to a controversial call that gave the Bulldogs a hard-fought 19-18 win and secured bragging rights between the two towns located less than 15 miles apart. The Dawgs scored with less than a minute on the clock to go up by one. With one last chance, Grapeland moved out to the 50 and inside Crockett territory. With 30 seconds remaining and all three timeouts, Josh “Bear” Ackley slammed his way down to the 30 yard line of Crockett. His forward progress was stopped, but rather than a whistle ending the play, the referees let the play continue as Ackley was being pushed backwards. The Dawgs eventually stripped Ackley of the ball, well after the play should have been over. Possession was awarded to Crockett, who ran out the clock to escape with a one point victory. On a drizzly night, the Sandies took possession of the ball to open the game at their own 34. Three straight incompletions by Rick Frauenberger led to a Grapeland punt which was downed at the Crockett 35. The Dawgs picked up the game’s initial first down on a Jordan Bedford to Demarcus Richardson eight- yard pass and a Malik Johnson plunge for two. A second first down soon followed as runs by Richardson and Johnson moved the ball inside of Grapeland territory to the 44. Bedford then found Allen Horace for a 16 yard reception. A sack Ackley forced Crockett into a third and 16 at the 34. Two straight incompletions gave the ball right back to the Sandies. Grapeland responded with a 27-yard, Frauenberger to Tyrin Wiley reception for 27 yards. The pitch-and- catch moved the Sandies onto the Bulldog side of the field for the first time of the evening but an illegal procedure call on first down along with a holding penalty moved the ball back across the 50. The Sandies were forced to punt and the Bulldogs took over at their own 16. Back-to-back runs by Richardson moved the Dawgs out to the 40. Crockett would not go any further though, as the Grapeland defense stiffened and forced a kick. Howard returned the ball 30 yards to midfield and then picked up eight on a completion from Frauenberger. The Sandies moved inside the 20 but an interception in the end zone, with a return to the 16 gave the ball back to Crockett. 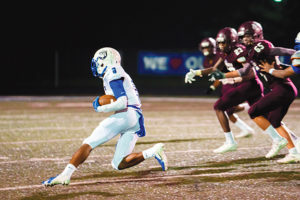 The Dawgs drove from the two out to the 40 of Grapeland and from there Joseph Porter took the rock to the house as the state champ in the 200m sprinted 40 yards for the game’s first score. The try for two was no good but at the 8:15 mark of the second quarter, Crockett led Grapeland 6-0. The Sandies took the ensuing kickoff out to the 25, but on the next play a fumble gave the ball back to the Dawgs. 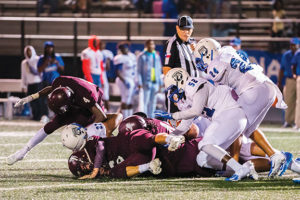 That – coupled with two unsportsmanlike conduct penalties against Grapeland – and Crockett was in business at the 15-yard line. The Sandies defense showed their teeth, however, and forced a 28-yd field goal attempt, which was wide left. Grapeland took over at their own 16 and moved out to the 40. From there, Frauenberger hit Ackley for 32 yards to move inside the 25 of Crocket, but a third interception of the half ended the Sandies’ scoring opportunity. With time winding down in the second quarter, the Bulldogs moved smartly down the field to get into field goal range. Antonio Cruz lined up to attempt a 43-yard FG, but as time expired in the half, the ball hit the crossbar and fell harmlessly to the turf. Crockett opened the second half of the game with excellent field position at the mid-field stripe. 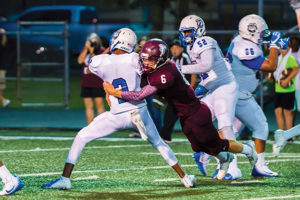 A five yard illegal procedure pushed the ball back and when the Sandies brought down Johnson for a one-yard game on fourth and two, it seemed to change the momentum. On third and eight, Frauenberger found Tyrin Wiley for a 50-yard reception. Unfortunately for the Sandies, a run and three straight incompletions gave the ball to the Dawgs at the nine-yard line. Grapeland held Crockett and forced the Dawgs to punt from the nine. The Sandies broke through the O-line to block the punt and took over possession at the Crockett 19. 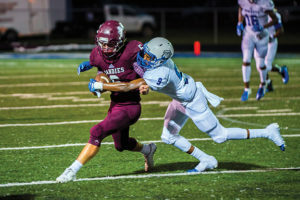 Frauenberger hit Lamb for 12 yards on first down and then the Grapeland QB kept it for the final seven yards as he crossed the goal line and tied the game at six. The extra point attempt was no good, but with 7:47 remaining in the third, the score was all knotted up. Following a missed extra point, the Sandies attempted an unsuccessful onside kick and gave Crockett the ball at their own 45. The Sandies defense continued to play lights-out defense as Ackley dropped Johnson for a loss on fourth and two and returned the pigskin to Grapeland the at their own 48. Lamb picked up nine on first down followed by a Keizion Ashford 12 yard run to move the ball to the 32. A short pick up by Ackley, an incomplete pass, a seven yard loss by Ackley gave the ball back to Crockett at the 36. Crockett returned the favor when Bedford was picked off by Keriaun Davis who returned the interception to the Crockett 28. The Dawgs held, however, and on fourth and 12, Frauenberger was picked off for the fourth time in the game. The Dawgs took over at their own 15 and moved out to the 45 on receptions by Owens and Ty White. Bedford hit Horace for a seven yard pick-up and then Porter broke free for 10 yards to bring the third quarter to an end, with the score tied at six. 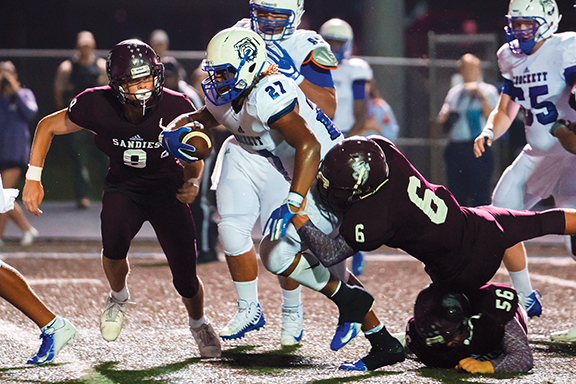 As the final period got underway, the Dawgs drive were stopped in their tracks as the Sandie defense forced a turnover on downs at the Grapeland 28. Two plays later, Frauenberger spied a wide open Keriaun Davis as the duo hooked up on a 72-yard catch-and-run for a TD. The extra point was no good but with 10:27 left in the game, the Sandies had taken their first lead of the game by a score of 12-6. Crockett took the kickoff and quickly made it to midfield. Johnson and Porter pounded the ball inside to move just outside the Grapeland 35. A 10-yard holding penalty pushed the Dawgs back near midfield, but a Bedford to Horace 16 yard gain plus an untimely penalty on the Sandies moved Crockett to the Grapeland 11. After picking up a first down at the one, Johnson bulled his way into the end zone from one yard out. Antonio Cruz knocked the PAT through the uprights and with 5:41 remaining in the game, Crockett reclaimed the lead by a score of 13-12. After the kickoff, Grapeland took possession at their own 25. An end around to Lamb picked up nine, but on second and one Frauenberger lost four yards. On third and five, Frauenberger found Lamb for 10 yards and was aided by a 15 yard unsportsmanlike conduct call on the Dawgs. The penalty moved the Sandies into the Crockett end of the field with four minutes left to play. On the next play, Ackley took a pitch, found the corner and motored his way for 45 yards and a TD to give the Sandies the lead at 18-13, with 3:47 left to play. The next Crockett possession began at their own 22 following a block in the back call. Bedford picked up 12 on first down. Once again they moved deep into Grapeland territory and picked up a first down at the 10 yard line of Grapeland with 2:34 left. Johnson and Richardson moved the Dawgs down to the two yard line to set up a fourth and goal with 1:15 left. On fourth down, Richardson took the handoff from Bedford and knifed his way across the goal to make the score 19-18 with 57 seconds left. Following the kick, Grapeland took possession of the ball at their own 25-yard line with 50 seconds remaining. Frauenberger threw incomplete on first and second downs leaving 39 seconds on the clock. A 10-yard reception by Lamb, plus 15 yards for a hit out of bounds moved the ball to midfield with 34 seconds left. Ackley picked up nine down to the 42 but on the next play, as Ackley powered his way down to the 30, his forward progress was stopped. The Dawgs kept pushing him back and despite the lack of forward movement, no whistle was blown. Crockett kept clawing at the ball and eventually wormed it away from Ackley to end the Sandies hopes of a comeback win. 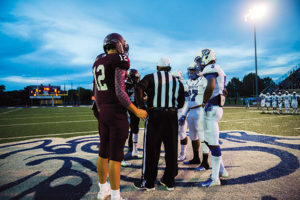 After the game, Crockett AD/Head Coach commented the Bulldogs struggled last season and in the first game of this season with findings a way to win. “We put ourselves in a position to win but we just didn’t. Tonight, we found a way to win. We found a way to score and we found a way to stop them. That’s the difference between winning and losing. It’s so close,” he said.